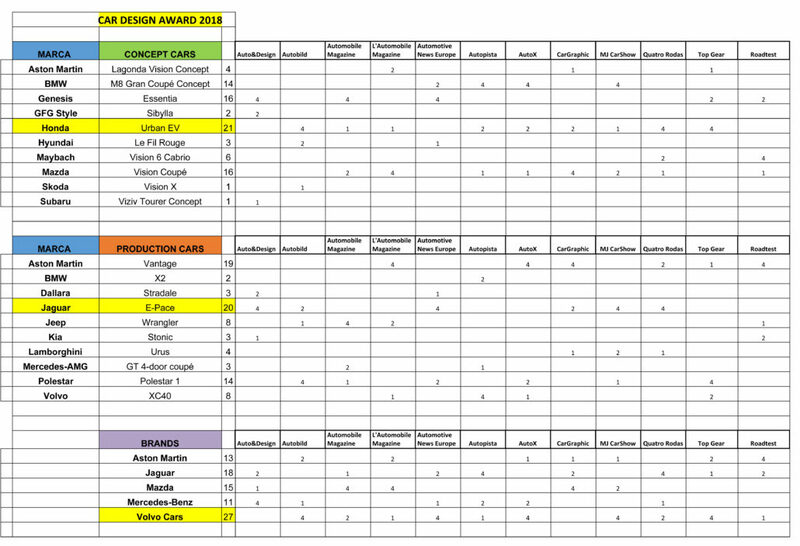 The design teams of Honda for the Urban EV Concept, Jaguar for the E-Pace and Volvo Cars for its product range design are the winners of the Car Design Award 2018, the new edition of the historical, coveted Oscar of world automotive design instituted in 1984 on the initiative of the magazine Auto & Design and its founder Fulvio Cinti. The award ceremony took place in Turin on 6 June as part of the Parco Valentino Turin Motor Show. “The Car Design Award has become a traditional date on our calendar and we are delighted to have hosted this event that has resonated worldwide ever since its revival in 2016”, said Andrea Levy, President of the Show’s Organising Committee. The Car Design Award was assigned for fourteen consecutive editions up to 1997. The award was then revived in 2016 in a completely renewed incarnation, faithful, however, to the spirit that had always characterised it: to reward the authors of projects that have made a significant contribution to the evolution of car design. Today as before, the winners are decided by a jury of experts representing the most prestigious world car magazines, thus ensuring an objective judgment on the world car design scene. The Car Design Award is divided into three categories: two of them, “Concept Cars” and “Production Cars”, are historical and have been joined by a third, “Brand Design Language”, an award to the design team that has worked best to maintain the consistency and transversality of a brand’s formal language over the entire product range. second place ex-aequo goes to Genesis design for the Essentia and Mazda for the Vision Coupé, and third place to BMW for the M8 Gran Coupé. the award for best project in the Production Cars section goes to Jaguar design for the E-Pace (with second place going to Aston Martin for the Vantage and third place to Volvo design for authoring the Polestar 1). taking away the prize in the Brand Design Language section is the Volvo Cars team (followed by the Jaguar and Mazda design teams, respectively second and third). The guest of honour at this year’s ceremony was Chris Bangle, a designer who has always been known for his compelling visions that often swim strongly against the stream. “Awards that acknowledge the truly important contributions of design – and the design team that created it – are to be celebrated.”, he recalled in his speech. “But for a designer the real reward is the honor to have been chosen by that idea to ‘bring it into being’.” Bangle is also a past winner of the Car Design Award for his work on the Opel Junior concept car, a project that won the award in 1984 when Bangle was a young interior designer at Opel. “This year’s edition confirms the work done by the Jaguar and Volvo Cars teams, who have already been among the winners in recent editions. For Honda design, on the other hand, the link with the Car Design Award goes back to the historic first edition in 1984, when the trophy for volume production projects was presented in Turin to the authors of the Civic,” said Silvia Baruffaldi, editor of Auto&Design and President of the Car Design Award Jury. The winners received trophies specially designed and produced by Brembo, a partner of the prize since its revival. “The combination of Brembo and design has lasted for more than 25 years, when we were the first to introduce a coloured brake caliper. Since then, design has become a hallmark feature of our products, continuing even today to be one of the characteristics that differentiates us on the market, where it is recognised as added value”, noted Alberto Ferrari, Brembo Marketing Manager at the award ceremony. “The Honda Urban EV is a wonderfully judged piece of design which brings a much needed sense of personality to the EV space. Its clever blending of both retro and futuristic aesthetics gives it an undeniable desirability that few can compete with”. “The E-Pace borrows the winning styling clues from its larger brother F-Pace, yet without being a baby F-Pace. Jaguar’s smallest SUV has its own, strong character aiming to attract metropolitan young buyers and comes in as pop music in the car world”. “From boxy station wagons designed first for passive safety to a full range of cars and SUVs that blend Scandinavian design with complex lighting solutions, as well as state-of-the-art man machine interface, the journey to a new, fresher and more compelling Volvo design language was successfully completed”.